The MRVPD invests energy and resources toward creating and maintaining a “safe, environmentally friendly, efficient, and integrated transportation network” in the Valley (MRV Vision Statement). This includes both active and mechanized transportation that unites the community, while providing access to and from other vibrant Vermont destinations. As an arm of the Mad River Valley Planning District, the MRV TAC provides a forum for the public to share and recommend planning improvements to the transportation system. It expands local decision-making and planning of transportation priorities, projects, and long-range plans to address transportation issues in the Mad River Valley. The MRV TAC meets monthly at the General Wait House, 4061 Main Street, Waitsfield. Please check the MRVPD Calendar to confirm that a meeting is being held this month, or contact office@mrvpd.org or 802-496-7179. Check the 2018-2019 Schedule on the GMT Website. Daily service runs late December through early April. In addition to regular daytime routes, the Valley Evening Service runs on Saturdays and select Sundays from 6pm-2am by request. The 1983 Memorandum of Understanding (MOU), between Sugarbush Resort the towns of Waitsfield, Warren & Fayston, the Central Vermont Regional Planning Commission (CVRPC), and the State of Vermont, serves as one of the formation documents of the Mad River Valley Planning District. It contains several provisions intended to regulate the rate of growth as it corresponds to increased traffic, patrons and a necessity for increased public transportation. The 1983 MOU was updated and replaced with the 1998 MOU. Sugarbush Resort presents an annual data report to the Mad River Valley Planning District (MRVPD) which includes information like number of skiers per car, numbers of cars in lots at peak times, and utilization of the public transit system (ridership, number of trips, etc.). Until the early 1990s Sugarbush Resort had its own seasonal bus service that ran from mountain to mountain and between their condominiums and accommodations. In the early 1990s, the newly formed MRV TAC created a three-year pilot bus program with the goal of providing a Valley-wide and commuter bus system. In collaboration with the MRVPD, Sugarbush and the MRV Chamber of Commerce, the MRV TAC crafted a Short Range Transit Plan that envisioned a cohesive, year-round Valley transit system. The group sought grants with a funding structure comprised of 80% federal, 10% state, and 10% local match contributions. The MRV TAC was initially denied by the Vermont Legislature because the state felt that the money was primarily benefiting the ski areas. MRV TAC members testified before the VT Senate, ultimately leading to agreement that public transit was sorely needed and serviced the greater good rather than simply providing funds to the ski areas. With funding, the local group was able to procure buses, find a service provider, and begin providing fare-free transit known as “Wheels.” Green Mountain Transit (GMT) assumed provision of transit in the MRV in 2003, converting the Wheels program to the “Mad Bus,” a fare-free seasonal shuttle service that covers the Valley Floor and Sugarbush Ski area. This service continues today under a new name, the Mad River Valley Bus Service, with updates anticipated as part of GMT’s 2017 Next Gen Transit Plan. See the latest MRV Bus Service Ridership Report by GMT here. State routes in Middlesex, Moretown, Waitsfield, Warren & Granville were granted National Scenic Byway designation from the U.S. Secretary of Transportation in 2008. The subsequent MRV Scenic Byway stretches 36.5 miles through Middlesex, Moretown, Waitsfield, Buels Gore, Fayston, Warren and Granville via Routes 2, 100, 100B and 17. 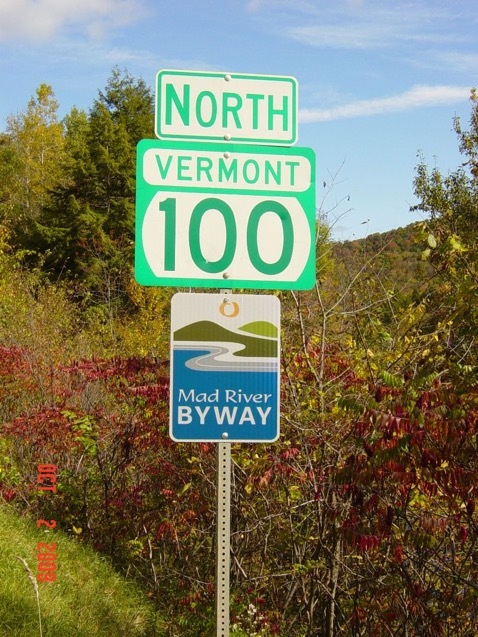 The Mad River Byway is one of 10 scenic roadways in Vermont recognized for its archeological, cultural, historic, natural recreational or scenic qualities. 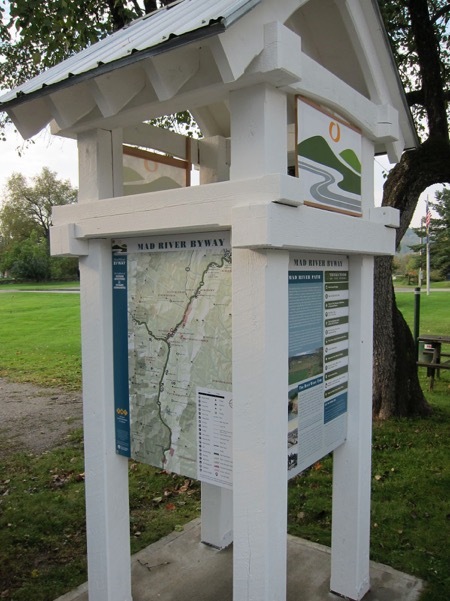 Designation made the area eligible for federally funded projects, such as roadside kiosks, interpretive signage, mapping and promotional material. The work was led through a MRV Byway Committee with technical support from MRVPD and the Central VT Regional Planning Commission. For more information visit the Mad River Valley Chamber of Commerce Website.